The Wools of New Zealand Brand represents the standard of excellence in wool carpets. The name and trademark, used exclusively on products containing at least 80 percent wool, with the majority (60%) being New Zealand wool, are applied only to carpets and rugs that have met the highest performance and environmental specifications. Wools of New Zealand Brand carpets combine the latest colors, patterns and textures with the classic beauty, comfort and practicality of New Zealand wool. And only carpets that pass more than 20 demanding tests related to fiber content, appearance retention, color-fastness and appropriate environmental performance carry our name. 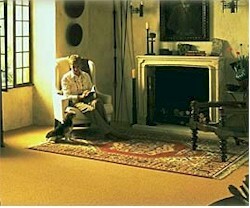 Naturally, our rugs are of the same high quality and standards. New Zealand wool creates the most colorful machine-made rugs in the world. Available in a multitude of designs that include traditional, oriental, transitional and contemporary, Wools of New Zealand Brand rugs make a style statement in any decor. Commercial carpets that earn the Wools of New Zealand Brand have met stringent performance requirements that enable them to withstand the high demands of commercial environments. The beauty, durability and cleanability of Wools of New Zealand Brand carpets make them a welcome addition to offices, casinos, restaurants, hotels, retail spaces and transit systems.